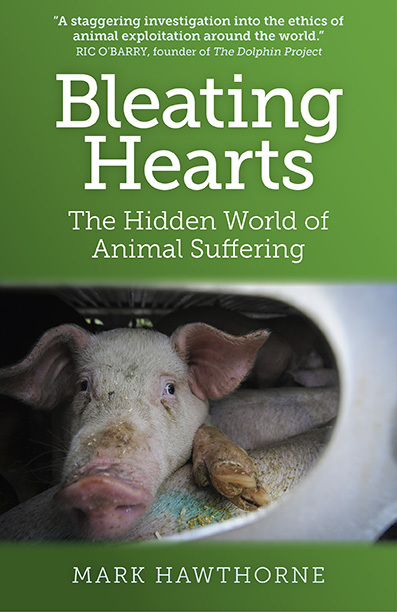 Bleating Hearts: The Hidden World of Animal Suffering examines the world’s vast exploitation of animals, from the food, fashion, and research industries to the use of other species for sport, war, entertainment, religion, labor, and pleasure. Thoroughly researched and eloquently written, this authoritative account of our mistreatment of animals will leave readers informed, shaken, and more than a little angry. Though animal abuse is generally well-hidden, make no mistake: Under every plastic-wrapped chicken breast in the supermarket, within every marine mammal park, and lacing every pharmaceutical there is a world of suffering that animal exploiters work tirelessly to guard. Armed with the knowledge of what goes on behind closed doors, we can all help make a difference in the lives of the defenseless. By exposing the truth of what animal profiteers endeavor to make invisible, we reveal a means to end abuse that is nearly as senseless as it is reprehensible. Whatever your stand on the issue of exploiting other species, Bleating Hearts is bound to alter the way you view our relationship with animals.